As we know, Lululemon has had a major problem with the lack of opacity in all of their luon pants for quite some time (over the past two years!). From Bordeaux Drama and Alberta Lake to their remarketing their very sheer Wunder Under pants to ‘Under Pants‘ back in January, to their disclaimers they added to wunder under pants ‘you may experience sheerness with some of our bottoms’ which they feel absolves them of quality expectations. I’m really not sure what is going on with this new shenanigan of a press release but I’m not buying it. 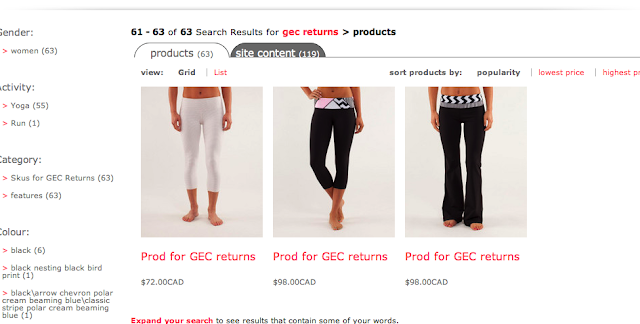 Nor is their manufacturer accepting the blame for something they say Lululemon has mandated and signed off on. So what then is behind this press release?? Is this merely a convenient scape goat for lack luster sales (caused by a long endured lack of quality)? I’ve now heard of a few store closures (Los Gatos Show Room, Burnaby Factory Outlet) and had heard rumors that stores are cannibalizing other stores that have been open for less than a year. I think it’s time the board take a very serious look at what the cost of such quick expansion really is, because you are losing us here. And you are losing integrity while you are at it. The move came after Lululemon recalled some of its yoga pants for being too see-through, and blamed the supplier. 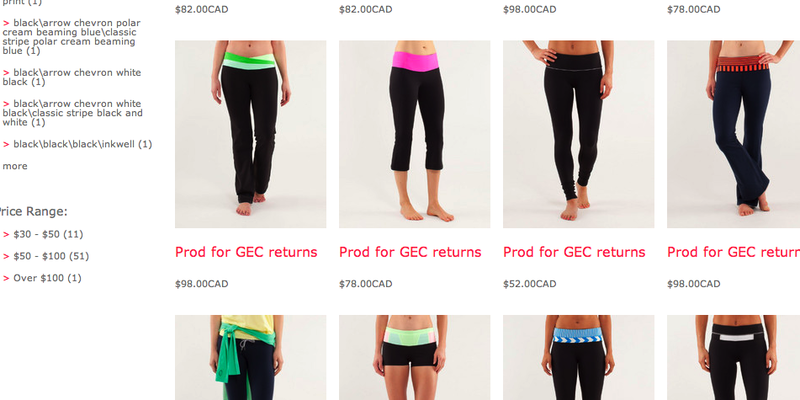 “All shipments to Lululemon went through a certification process which Lululemon had approved. All the pants were manufactured according to the requirements set out in the contract with Lululemon,” Eclat Chief Financial Officer Roger Lo said. The U.S. retailer said in a statement Monday that a mistake by a supplier left its black signature Luon fabric pants, which arrived in stores March 1, too sheer. It has pulled the pants from the shelves and is offering refunds to customers who bought them. The company said the recall may cut its first-quarter sales by 3%-4%. Lululemon shares slipped more than 6% in after-hours trading following the news. Mr. 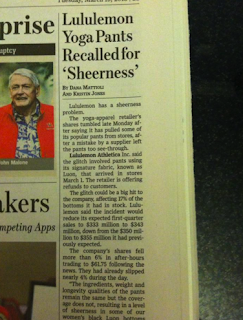 Lo confirmed with The Wall Street Journal on Tuesday that the company is supplying Luon pants to Lululemon. But he insisted the materials aren’t problematic and that the manufacturing process complies with Lululemon’s requirements. He said Lululemon hasn’t contacted him or the company since the news broke, so he wasn’t able to tell what might have gone wrong. Mr. Lo said he wasn’t sure where Eclat’s factories produced the Luon yoga pants nor where the materials were sourced from. “Throughout the whole process, Lululemon hasn’t raised any questions or concerns,” he added. Eclat, established and based in Taipei since 1977, is a contract manufacturer of functional sportswear and stretched knitwear, designing and producing for brands such as Columbia, Asics and Lululemon. Over the past 10-odd years, Eclat has been branching out from Taiwan and has built factories in Vietnam, Cambodia, China and Lesotho in southern Africa, induced by tax breaks and lower labor costs. According to the company’s website, it produces 3.5 million pieces of apparel a month, 45% of which come from its four factories in Vietnam, and one-fifth from its two facilities in Lesotho. Taiwan only houses 14% of its capacity. On Tuesday, shares of Eclat ended 1.6% lower in Taipei at 122.50 New Taiwan dollars (US$4.11), while the benchmark Taiex gained 0.4%. Just some of the pre-March 2013 items that may have been effected by sheerness.